The Door to Cyrodiil is the gateway that connects the Province of Cyrodiil to the Shivering Isles (quest-related). 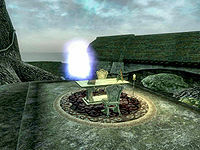 On the first trip through the door, the player will encounter Haskill, who starts the Main Quest by offering a unique opportunity. 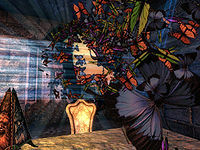 The area around the door initially appears to be a room with solid stone walls; once you have agreed to enter the Isles however, you will observe that it was actually a shelter made of a swarm of fluorescent butterflies. On the Cyrodiil side of the door, it is known as A Strange Door. 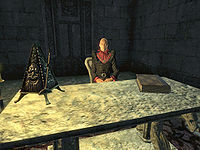 When the Fringe is taken by Order during the main quest, the map marker for the location will change to an Ayleid Ruins icon. It will revert to a landmark icon once the main quest is complete. This page was last modified on 5 July 2014, at 21:48.